The new story from Kristinn Taylor over at the Gateway Pundit reports that according to former ‘spook’ John Schindler, the CIA is trying to ‘take out’ president-elect Donald Trump before he’s sworn into office in 6 days. Schindler’s warning, coming soon after New York Senator Chuck Schumer warned Trump ‘intelligence agencies have 6 different ways from Sunday at getting back at you’, had thoughts of John F. Kennedy in Texas on November 23rd of 1963 immediately coming to mind. The Gateway Pundit story joins a huge number of recent stories from across the internet that warn of possible chaos and turmoil ahead in the coming week as the ‘heads of globalists and liberals’ metaphorically explode with Trump coming into office in 6 days. With calls for martial law and a ‘national emergency’ to stop Trump from taking office continuing to ramp up while anarchists plans to shut down the inauguration turn towards violence, the recent story that the commanding General of the DC National Guard will be stepping down precisely at 12:01 pm on Friday is at least highly unusual if not outright alarming. And while the sitting head of the Department of Homeland Security, Jeh Johnson, has stated that the government sees no immediate or credible threats to Trump’s inauguration on Friday according to this Yahoo News story, anybody who’s been paying attention knows that may not be the ‘whole truth’ or is outright preparing cover up for ‘an event’ to take place that day. 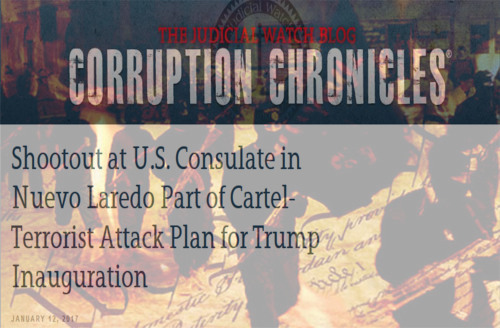 As high level law enforcement and intelligence officials recently told Judicial Watch, Islamic terrorists have plans on attacking America during the period of Trump’s inauguration. Warning us of a ‘broad operation between Islamic terrorists and Mexican drug cartels to send President-elect Donald Trump a message by engaging in attacks at border ports and in American cities’ in the coming days, does Obama’s DHS not have the same information and sources? Or, are we now witnessing preparation for another massive false flag and a ‘cover up beforehand’ in play? You can hear more about the Judicial Watch story in the 2nd video below. As Susan Duclos reported on ANP on Friday, the left is having a major meltdown with Trump coming into office with the mainstream media seemingly attempting to push America into a civil war here upon US soil over Trump while the war against independent media rages on. With the globalists going so far as attempting the Orwellian moves of criminalizing free speech while labeling truth ‘propaganda’, we smell something really nasty in the works, coming straight to America from Washington DC and Langley, Virginia. To say we’re getting a bad feeling about this week would be an understatement. We pray that this intuitive feeling is wrong. And since Schindler has gone so far as to warn us on Twitter that ‘they are taking traitor Trump out now’, more than a hundred million American patriots know who would likely be to blame, the ‘most likely suspect’, if something horrifying happens to Trump. As we reported just days ago in this ANP story, according to one US Army Veteran/US Patriot, history appears to be ‘repeating itself’. And after hearing the kind of talk we’ve been hearing recently from obviously ‘disturbed’ liberal snowflakes, we should all be praying for Donald Trump’s safety and protection. What might we see in Washington DC and across the country on Trump’s inauguration day? 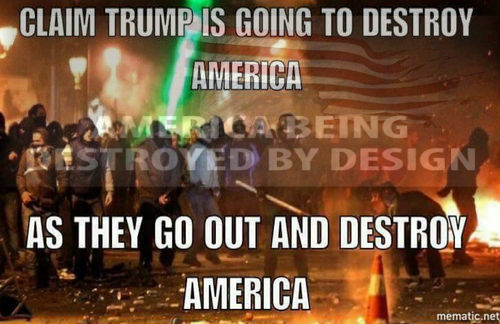 A spokesperson for DisruptJ20 expects ‘it will get pretty crazy’ as they plan on making Friday something that Washington DC has never seen before. Will ISIS terrorists planning a ‘bloody Friday’ for Trump’s inauguration join them in their pursuit? 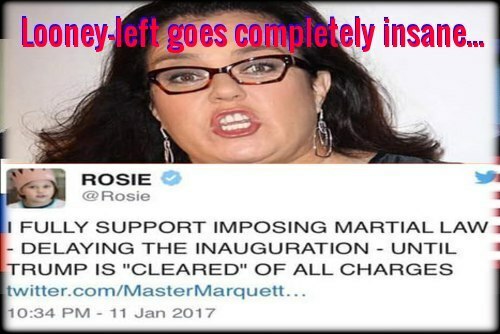 A very thin line often separates legal ‘protesting’ from ‘terror’, especially if protest turns violent, and we wouldn’t be the least bit surprised to see some protesters live up to the moniker ‘useful idiots’. According to Legba Carrefour, a spokesperson for DisruptJ20, one of the goals of the group is to block major transportation routes into and throughout our nation’s capital. And he is not shy about the fact that they literally want to “shut down the Inauguration”. With any real moves to stop Trump from taking office possibly leading to the next civil war upon US soil, (exactly what some communists and globalists are seemingly pushing for as it would lead to the ‘national emergency’ or ‘martial law’ they want), we pray that Trump is protected by God’s armor in the days and weeks ahead as we come down the homestretch of the most important year in America’s recent history. And with the American people rising up and shutting the globalists down here, just as the British people did in the UK with Brexit, many of the goals they’ve worked towards accomplishing for decades could all come crashing down in just 6 days. And these protests are not going to end on January 20th. In fact, abortion advocates are hoping to get close to a million women into Washington D.C. on the day following the Inauguration to protest for abortion rights. Filmmaker Michael Moore is hoping that this march will be the beginning of “100 days of resistance” against Trump’s presidency. In the final video below, Alex Jones warns that it’s time for Americans to get proactive in exposing the globalists infiltration of America and their plans of attempting to overthrow a fair election that saw Donald Trump elected. Warning us once again of their intention to declare martial law or a national emergency, we pray for America.